I hope you all had a blessed first Sunday of Advent! Our day was beautiful and peaceful, despite the excessively rainy weather, flood warnings, and Captain coming down with an awful stomach virus... We made the best of it and (thankfully) by the end of the day he was feeling much better. Deo Gratias! As you probably noticed in my last post, I did end up wrapping some of our Advent and Christmas themed picture books in purple, pink and gold paper for the children to unwrap each day during Advent and over the twelve days of Christmas, like we have done for the past few years now. I usually wait until Christmas morning to add the twelve books wrapped in gold for the twelve days of Christmas, but since Advent is short this year, and I had extra room in the basket, I went ahead and included them as well. I then piled the remaining books in a few additional baskets and moved them to the living room so they are readily available. Our collection has grown so much over the past years, and I was having such a hard time choosing books to wrap! How was I going to decide which ones to focus on this year?!? I finally gave up and asked all the kids to choose four favorites each off the shelf and bring them to me... They were all very excited and I ended up with a nice big stack of 25 books, since someone (Rose) apparently snuck in an extra! *Decorate for Advent with Advent Calendars, Advent Wreath, Jesse Tree, etc... Set out Manger for Baby Jesus and all of our Christmas Books. Bless the Advent Wreath during nighttime prayers. Choose names for Christkindl! * Birthday Party for Rose! *O Dayspring... Hot Cocoa in thermoses and drive around to see Christmas lights in town after dark, then head to friends home for a Christmas Yule Party! *Bake and Decorate Cut-out Cookies. Note: Some of the books on our reading lists have study guides in either Christmas Mosaic, An Illustrated Book Study for Advent and Christmas or Catholic Mosaic: Living the Liturgical Year with Literature an Illustrated Book Study for Cathoilc Children, which we will be using as well! This is our first year to wrap the books for Advent, I'm so glad you've shared this tradition and always add what books you use. My youngest was absolutely thrilled to open his book last night and have me read it to the family. 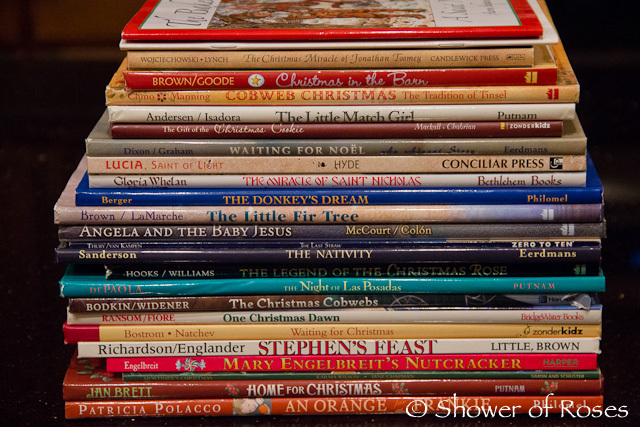 I plan to 'add' books to our collection, using your list as a reference, during the 12 Days of Christmas. 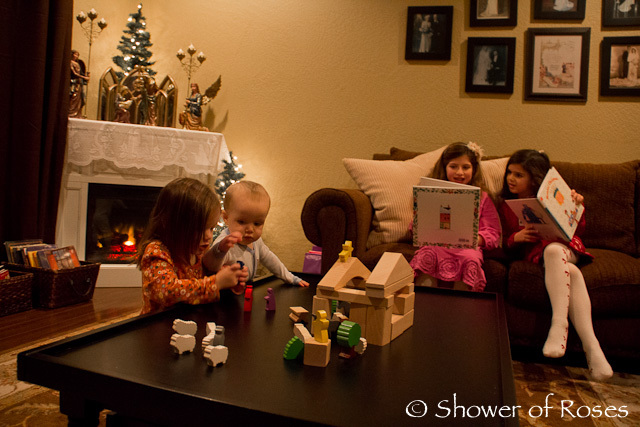 Can you tell us about the nativity figures on your mantle? They are breathtakingly beautiful! Thank you! I actually purchased the Holy Family Statues at Costco back in 2010. (It's a little blurry, but you can see them in this post.) I think I only paid $28 for the set, including the background/mirror! The angels were also from Costco, and though I did see them a number of years ago, I couldn't purchase them at the time, as much as I loved them. I was so excited this past summer when a dear woman from our parish gave me the set! They have been sitting on top of my bookcase that hold's all of our saints and feast day books. They match our Holy Family Statues too nicely to not display them together for Advent and Christmas! Yes, I do usually purchase our books new - though I try and find them at 30-40% off at least. I also try and go with hardcovers when I can. When I do purchase used books, I look for ones that are in "Very Good to Like New" Condition when possible. My oldest two boys (actually all my boys for that matter) are so great at taking care of our books... the girls are a completely different story, but we are working on it! I bought a few bookshelves last March (I never did post pictures of them all assembled, since that was when my girls came down with pneumonia) and I have one in the hallway that has most of our Catholic Children's Books - 3 shelves have saint books, 1/2 shelf has Easter books, and 1 1/2 shelves are for our Christmas Collection. The bookshelf in the Boys room is where they have all their books and quite a few of the history chapter books (bethlehem books, etc), the girls have a bookshelf in their room with all their books and (up until last week when I couldn't stand the books shoved on the shelves any longer) all the preschool books (I just moved them to a bookshelf in the nursery (up high, other than all the board and fabric books) and the rest of our books are in the school room and my bedroom/closet. Sometime I will try and take a few pictures. Thank you for the thoughtful reply! I would love to centralize all our books. They are in the so-called "book room", a little room upstairs off of ours, but now it serves also as a bedroom, and is crowded and haphazard. (I also have a box of books that are falling apart, and one history book is all loose pages!) I can't bear to throw them out, but many are past repair. It makes sense to buy new, or in as good a condition as possible. I love books, and am trying to resist the temptation to order all the ones I don't have!! This is such a great resource Jessica!! Your living room looks beautiful! We needed to do some different things this year, with the older kids, well, getting older and the younger ones needing the excitement of it all! Thank you Jamie! 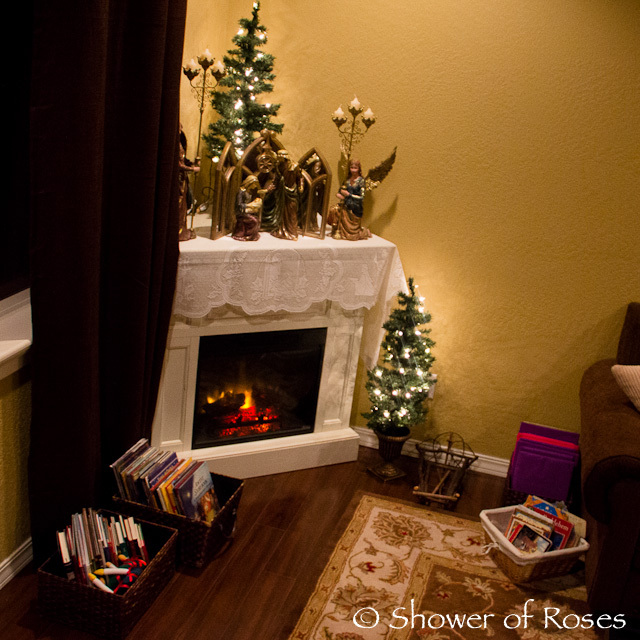 It is simply decorated with a few things, but it does feel so nice and cozy! I love this time of year!! And don't you just love that! There is something so special about unwrapping a book, even if it is one you have read many times! And it's even more special for the kids to know that their mom or dad is going to read it with all of them. This little tradition is creating some of the best memories! Oh, I know, there's something about ripping into something, that adds to the excitement! I'm planning on using some of the ripped paper pieces, and leftovers for collages...makes it not as wasteful, right? (not really) Paper is pretty cheap, huge double sided roll, that will last for years at Sam's Club for 9 something! The big kids always beat me to reading to the littles, They read yesterday's book and I felt a little disappointed inside, but then, watching my Bridget snuggle with her big brother, was so precious. This is one that we have checked out from the library in the past. Nine Days to Christmas by Marie Ets. I've always enjoyed other books by this author, and this one particularly. You know I was just looking at that book and wondered if it would be good. I wanted to see if our library had it so I could preview it before spending the money. Thanks for the recommendation! The book is charming; it's a story of the celebration of Las Posadas in Mexico. Hope your library has it! I think it's worth reading. Another I do recommend (if you're looking for new ones, because I didn't notice it on the list) is The Little Lamb of Bethlehem by Margaret Tempest. It's put out by the Medici Society (written in 1957). They have another one about Christmas too in the same vein, but it has fallen apart so I can't reference it! One we picked up at a library book sale (but is now going on Amazon today for $150) is For Every Child A Star by Thomas Yeomans, illustrated by Tomie De Paola. Maybe your library would have it? It's set in the Holy Land, at the time of Christ's birth. Worth reading, but not paying $150 for! Our selection is by no means comprehensive; there are endless possibilities out there! You've done a good job of narrowing them down, and compiling the list. Thanks again :) Have a blessed Advent, and happy reading! After looking more, there are copies of that book that are more reasonable. Sorry my links never work, though. 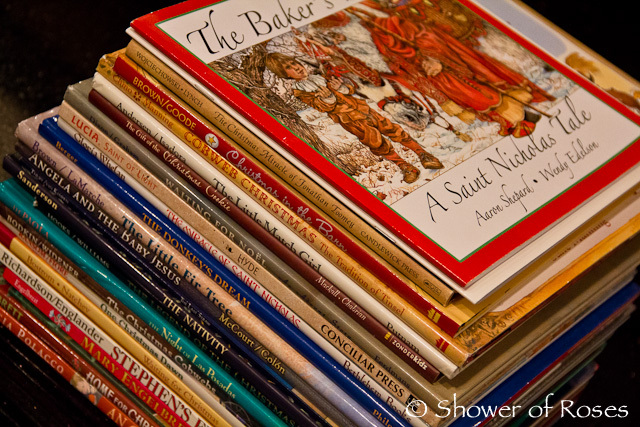 You have such a wonderful collection of Christmas/Advent books! Ours are all in storage this year due to temporary living arrangements and they are what the kids miss most of all their stored belongings. We found a few good ones at the library and I plan on scouring Half Price Books for a few more. Have a blessed Advent! 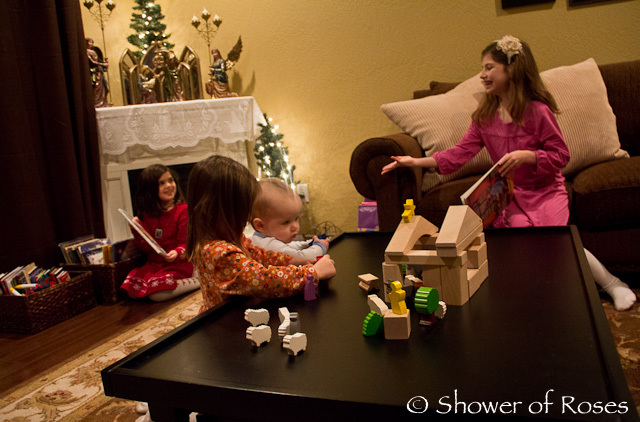 Hello Jessica, would you know where your wood nativity block set is made? My set was made in Germany by HABA. It doesn't look like they make it anymore, and the link I have was updated with a version made by Constructive Playthings. I'm not sure where the updated set is made. Thank you! Yes, I did mean country. Silly question here, but where do you find purple wrapping paper?? I just went to every store looking for it and had no luck! BTW, you are truly amazing and I love all your ideas. Thanks! Not at all! I use to have a hard time finding it too, and need to remember to mention that in my planning posts next year! I've always been able to find it at Target! 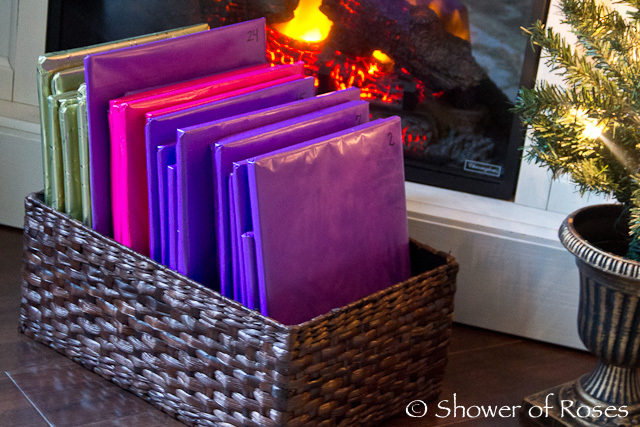 They also have a Purple Paper with Pink Dots that works great for the third week two. This year, being a shorter Advent, I didn't quite use two rolls of the purple and still have some of the one roll of pink leftover as well. I'm sorry you had to spend so much time looking!! Thank you Tiffany! I hope you and your family have a very blessed Advent too! What an awesome list! Thank you Jessica. Glad you guys are feeling better. WHERE did you get that AWESOME block set? I've been looking for something like that for my daughter. I love it! Where did you get purple wrapping paper?? I wrapped up books for the first time this year, and all I could find was purple and pink tissue paper, which is a little bit transparent... so I have been telling the kids, "Don't peek!" Ha ha... wrapping them up adds some excitement; we wrapped some of ours, some from the library, and the rest will be put out a few at a time over the next few weeks. Thanks for sharing the fun idea! Okay, so I should have read the other comments first to see that you already answered this! Ahh, Target, maybe one day our town will have one! I found purple and pink wrapping paper at the dollar store. How big were the rolls at the dollar store? Did you end up needing very many rolls? I will have to check there next time! Great book list. I am going to try over the next year to buy some more of these and do the wrapping of the books next year. Any idea why the St Lucia books are so expensive? Geesh. You'd think they we printed in gold. Maybe they will be better prices off season. I wanted to get a new one for this year (last year we read the Kirsten on) but it's just not happening. I know! Do watch for them during the summer months, they can be found much more affordably. Which St Lucia books do you have already? In the meantime maybe your library has some of them? We only have the Kirsten book. I tried the local library system and the New York City Public Library (you would think with millions of people there would be something). But, NOTHING! I was so excited when we got the New York City Library card through my husband's work, but so far I haven't found anything that I have been looking for. I do have the UNICEF Celebrations Around the World book that has a couple of pages on St Lucia Day, I guess we will use that for this year. Lovely selection of books here--would love to read many of them if I have children someday! 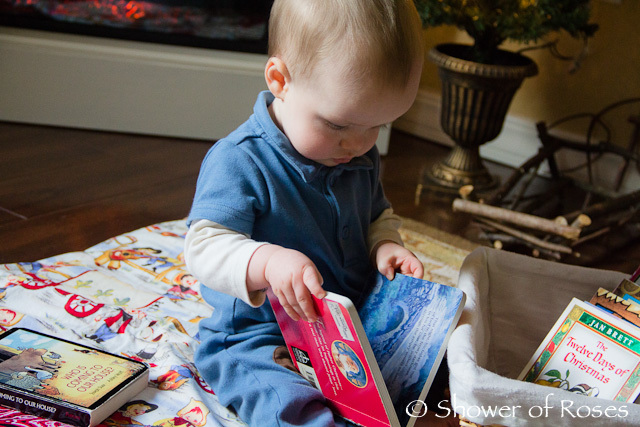 In the meantime, here are some more Christmas books which your family might enjoy. My apologies if I have listed any by mistake that you already own! Thank you for sharing all of your wonderful resources with us. Your living room looks so warm and inviting. I was wondering where you got that train table for your living room. I would love to have a pretty train table as a coffee table, especially one with storage. Hello! I realize this post was from last year, but I just needed to say thank you for generously sharing your book lists! I stumbled across your site while searching for books to read during the advent season and here you have gathered a trove of information. My husband and I were blessed with our first child this year and I am so excited to celebrate our first Christmas as a family. Although she's much too young for many of these books, I still hope to establish wonderful traditions full of Light and Love starting with her very first Christmas. Thank you again for your help.